José Luís Peixoto (1974) is one of Portugal’s most acclaimed and bestselling novelists. His first novel Nenhum Olhar (published as Blank Gaze in the UK by Bloomsbury and as The Implacable Order of Things in the USA by Doubleday/Anchor/Random House) won the Jose Saramago Literary Award, granted every two years for the best novel written in all Portuguese-speaking countries, and was selected by Financial Times as one of their best books of 2007. In the USA, it was a ‘Discover Great New Writers’ selection by Barnes & Noble. In 2010, Peixoto published the novel Livro, which won the literary award Libro d’Europa in Italy and was short-listed for the Femina Award (France). In 2012, he published Dentro do Segredo, Uma Viagem na Coreia do Norte (‘Inside the Secret, A Journey in North Korea’) his first work of non-fiction. 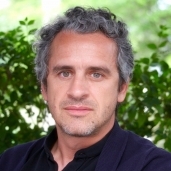 In 2016, his novel Galveias won the literary award Prémio Oceanos, granted to the best novel published in all Portuguese-speaking countries, in 2015. Peixoto’s poetry and short stories have appeared in a great number of anthologies in dozens of languages. All his novels have been internationally acclaimed and, so far, have been translated in 26 languages. Photo by Patrícia Pinto.